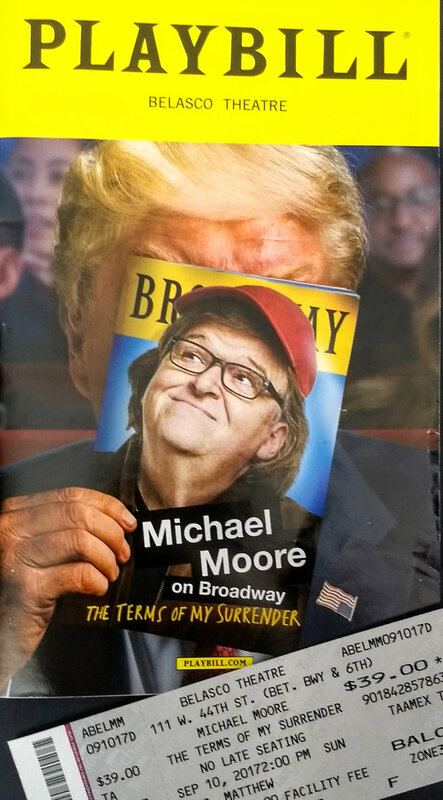 Documentary film maker Michael Moore is currently doing a run of shows on Broadway in New York. The Terms Of My Surrender is playing at the historic Belasco Theatre, and each show has a different guest, interviewed toward the end of the performance. Last Sunday, September 10th, Roger Waters took the opportunity whilst in town for his shows at Brooklyn's Barclays Center to participate in the show (a matinee). Waters spoke for a good twenty minutes or so (an excerpt is shown below) talking about a number of subjects, particularly Trump and the legislative changes he is attempting to effect, much to the shock of the audience. He also informed a shocked Moore about how his father was killed during the war, at Anzio. Outside the theatre were a few protesters, and a couple were present in the auditorium; amidst the cheering for Waters were a couple of dissenting boos, which Waters met with his reasoning that he wanted people of all races, religions, political persuasions and such like to have basic human rights, and if you are booing that, you are booing this concept. This seemed to mollify the protesters, who didn't seem that committed to their cause anyway.